Effortlessly glides for silky, smooth skin! Lubricating strips with Vitamin E and Aloe pamper your skin. 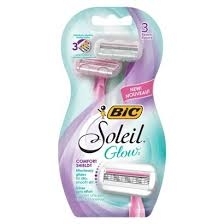 BIC Soleil Glow razor effortlessly glides for silky, smooth skin. It features a comfort shield head that evenly distributes pressure, glides and helps protect your skin from irritation. The 3 flexible blades individually adjust to all your curves while the ergonomic, rubber-grip handle and pivoting head provides ultimate comfort. The Vitamin E and Aloe enriched lubricating strips pamper your skin.